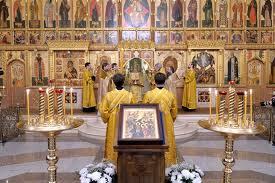 I am a convert to Orthodoxy from Roman Catholicism. My chrismation took place at St Nicholas Cathedral in Washington D.C., the seat of His Beatitude Metropolitan +Jonah, primate of the Orthodox Church in America, who received me into the Church in December 2011. I took Silouan of the Holy Mountain as my patron saint. My immediate family and most of my relatives remain Catholic, and I hold no negative feelings toward the Church in which I was raised. Theologically, I consider my entry into the Orthodox faith as an acceptance of the catholicity of the Tradition of the early Church, a common heritage the East shares with the Roman Church, rather than as a rejection of or departure from Rome. I am grateful to the Roman Catholic Church for teaching me the Christian faith as a child, in providing so many invaluable life-saving services as the world’s largest charitable body, and continuing to educate more people than any other institution or group. Why did I leave the Church in which I was raised? 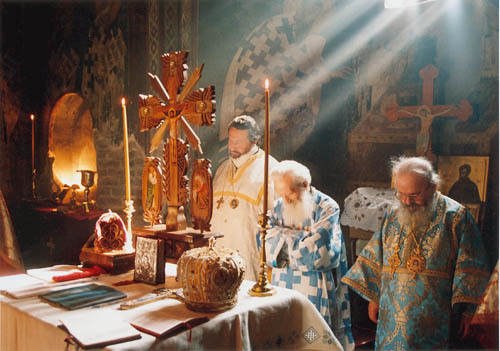 It was a very drawn-out and difficult decision which involved many hours of prayer and soul-searching, and until I experienced the Orthodox Divine Liturgy for the first time in April 2010, I had no real idea of where exactly I could look for a real alternative to Roman Catholicism. At that time, I certainly did not have any semblance of the larger reality that the Orthodox Way is a profoundly distinct approach to God which developed apart from the Western tradition, which originally included only the papal Church but then gave birth to the Reformed or Protestant churches beginning in the sixteenth century. 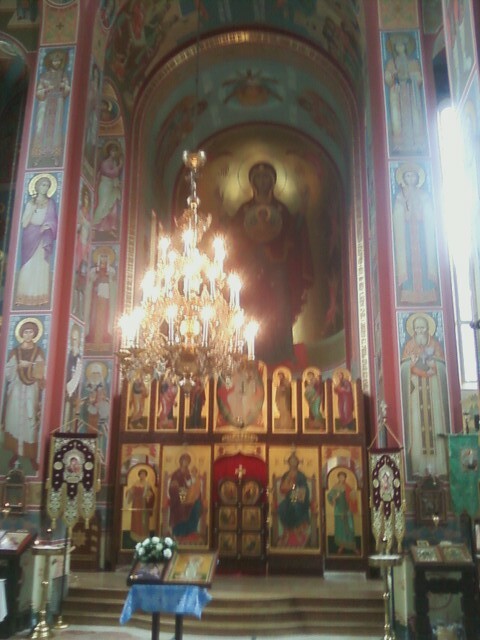 Several years before I experienced the Orthodox liturgy for the first time, I was something of a spiritual wanderer. 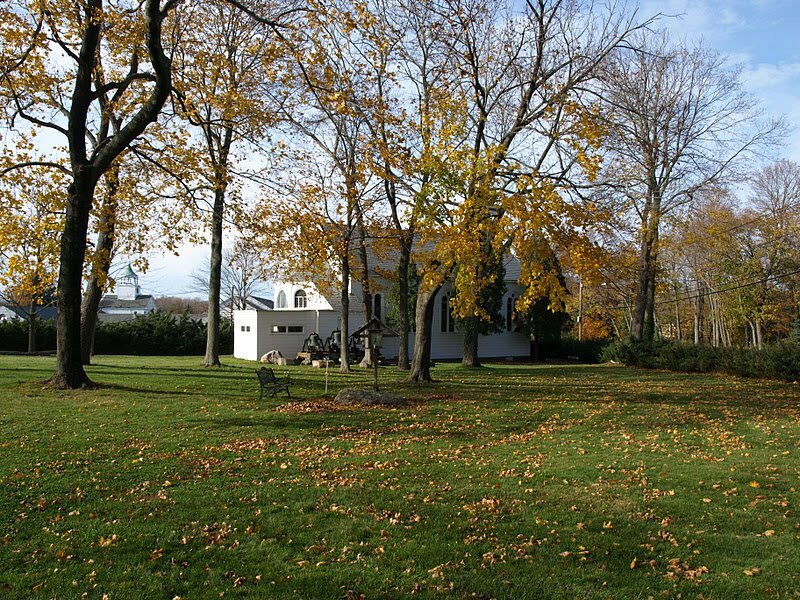 In my first two years at American University I regularly attended Sunday evening Mass with friends at the Kay Spiritual Life Center on campus. Sometimes I went to a beautiful Gothic church, St. Anne’s in nearby Tenleytown, but I felt restless, as though I was being called to experience different religious traditions. I knew I did not believe in certain core Catholic theological teachings, most of all, the dogma of papal infallibility ex cathedra, yet I was unsure of where I should or could look outside the Roman Catholic faith in which I was raised. 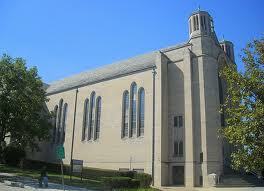 St Anne’s Catholic Church in Tenleytown, Washington D.C. In high school, studying the different world religions had always fascinated me, especially eastern traditions such as Hinduism and Buddhism. I had studied Judaism in detail, and I participated in the Hebrew Culture Club, but I knew I would not be ‘leaving Jesus’ as it were—I truly believed Him to be the Son of God and God Incarnate. Since I had been to several synagogues as a teenager with Jewish friends, I remained very interested in Judaism, as I still am today – but I knew I would not convert. I had read much of the Qur’an and Islam intrigued me, especially given the basic ignorance that many Americans were demonstrating toward the youngest of the three Abrahamic faiths in the years following 9/11. In my interfaith work I had met and come to know many Muslim students who were deeply sincere and pious believers, yet who were never aggressive or sanctimonious about their beliefs. I never considered becoming a Muslim, and after reading through the Qur’an, I was surprised and often deeply disturbed by what I found. While many passages urge Muslims to live in peace with their fellow “Peoples of the Book”, Jews and Christians, other passages are graphically violent, urging the maiming and killing of non-believers (Suras 2:191-193, 5:33, 8:12 9:5). While most Muslims obviously do not take these passages literally or enact them accordingly, their very inclusion in the Qur’an, which the vast majority of Muslims believe came as direct revelation from God, deeply disturbed me. Nowhere are Christians ever urged to slaughter their enemies in the New Testament. Theologically, Islam is fundamentally a religion opposed to Christianity in its view of who Jesus was and will be. Several passages in the Qur’an teach that Jesus was only a Prophet of God (4:171, 5:17, 5:75) who at the Day of Judgment will emphatically deny before God that he ever claimed divinity (5:116, 5:72, 3:55). Islamic jurisprudence considers shirk, that is, making partners to God, the one unpardonable sin: “Whoever joins other gods with Allah, Allah will forbid him the garden [Paradise] and the Fire will be his abode.” (5:72). In 5:17, those who believe Christ is God are condemned as living “in blasphemy”. Islam thus incorrectly assumes that Christian belief in the Trinity is tritheism, belief in three gods, and so the unpardonable sin of shirk. In effect, the Qur’an teaches that Christians were misled or deluded into making Jesus and Mary ‘gods’ beside Allah (9:31, 19:88-92); this view of course ignores that orthodox catholic Christians venerate but do not worship Mary, and consider Jesus to be fully God, not God’s ‘partner’ or a distinct god beside Him. Interestingly, the Qur’an, which Muslims believe to be directly revealed from God, holds that Jesus performed many miracles (5:110, 3:49), but by Allah’s power, not his own, and was actually a Muslim. This word means someone who submits to Allah, the Arabic term for “The God”. Curiously, the Qur’an refers to Jesus indirectly and by name almost one hundred times in fifteen suras (chapters), far more than it refers to the Prophet Muhammad. The Qur’an holds Mariam (Mary) in high regard (21:91, 23:50), mentioning her by name far more than the New Testament. Many suras affirm her annunciation and virgin birth (19:19-22) as well as Jesus’ Second Coming (43:61). Prophet Muhammad is, ironically, not expected to return to earth. In its view of Jesus, the Qur’an can be considered an antithesis of the Christian Gospels. It explicitly denies the Crucifixion (4:157) and thereby the Resurrection, claiming instead that Jesus was assumed bodily into heaven without death. Muhammad, by contrast, died and was buried at Medina, Islam’s second holiest city in modern day Saudi Arabia, where he and his first supporters found refuge after the Meccans expelled them. 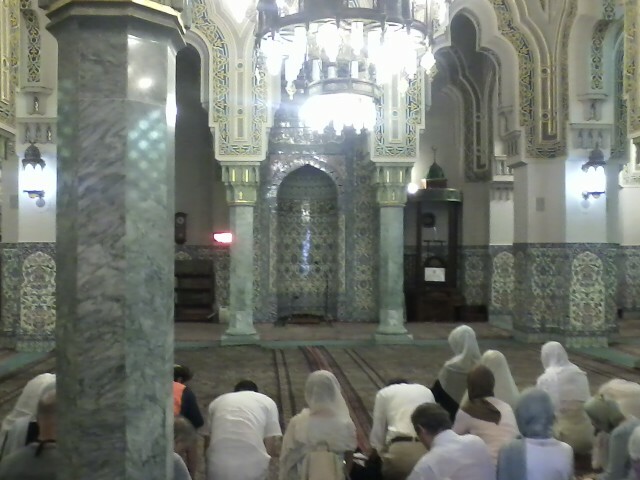 Facing the mihrab inside Islamic Center of Washington D.C. As you can tell due to the men and women sitting together and the absence of an imam (prayer leader), the prayer hall is mostly filled with non-Muslims. I took this picture during an interfaith tour of the mosque. During my years of searching and study, I continued to read widely on different religious and faith traditions, including Hinduism, the Baha’i faith, Mahayana and Theravada Buddhism, and Sikhism. I knew that I was committed to the Christian faith, but I could not find the right Church or denomination where I sensed my whole being was finding connection to God. I was not convinced that any of the Protestant churches were the true Church – not that they make the claim to be the ‘original’ historic Church, since this claim is chronologically impossible, but I developed the clear impression that most if not all of the mainline Protestant churches were being overrun by ‘culture war’ battles between liberals and traditionalists, with the former being inconsiderate in their rapid advancement of a revolutionary agenda and the other side often lacking love in their response. Each was losing tens of thousands of members each year. For a long time the Mass had not been fulfilling my soul’s craving for a more mystical approach to God, a more historic and ancient faith rooted in the mindset and experiences of the first Christians. I never left Christianity, much less ‘abandoned God’, but for many months wondered at where I could possibly find a safe harbor for my soul. 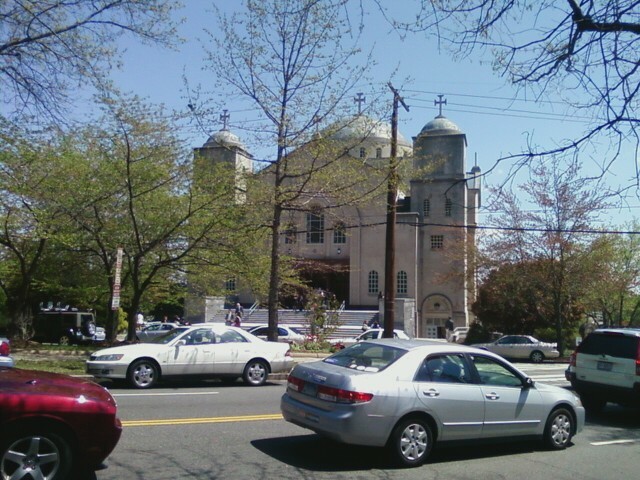 Entering St. Sophia Greek Orthodox Cathedral in D.C. in April 2010 for the Holy Thursday liturgy of St. Basil the Great, it was as though I had found my answer – or rather, the answer found me! Many of my Catholic friends wondered why I was becoming Orthodox. 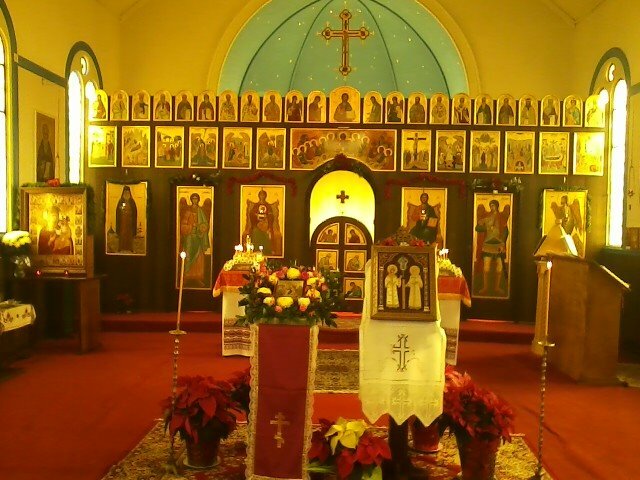 Those who have accepted my invitations to attend vespers or the Divine Liturgy at St. Nicholas usually are much more understanding, and several Catholic friends have told me that “if it weren’t for the Pope” they would become Orthodox. Looking back on the last few years, it amazes me that I did not see the signs pointing me to Orthodoxy earlier. 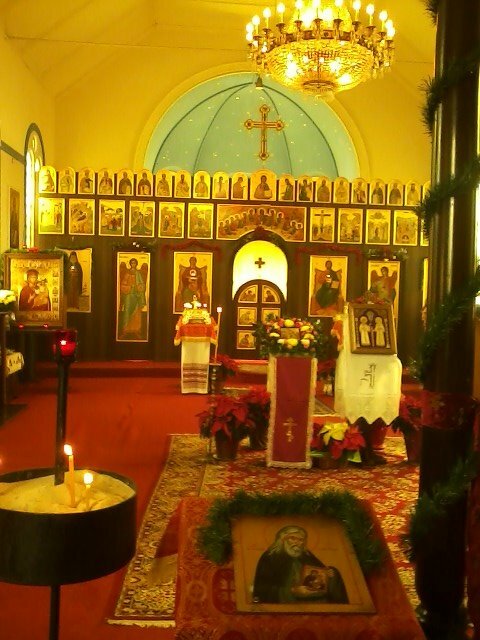 In my hometown of Setauket on Long Island, there is a small Orthodox men’s monastery to which I always felt an inexplicable draw and have, since entering the Church, attended several times for Divine Liturgy. There is also a Greek Orthodox parish, the Church of the Annunciation, which I would pass while on my daily cross-country runs with the boys’ team throughout high school, and I always felt a compelling draw to this mysterious Byzantine-style building. 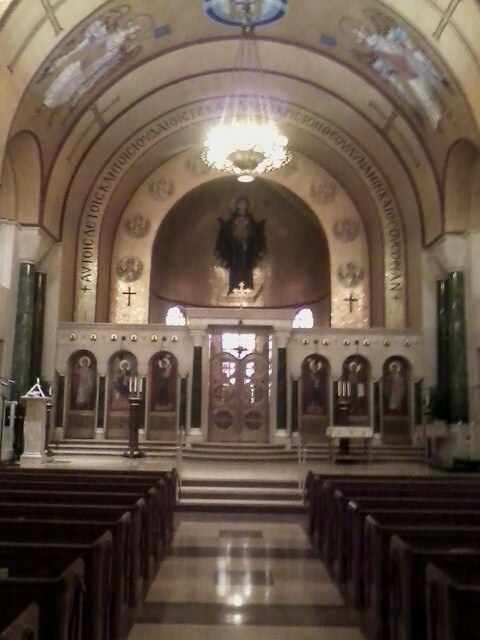 Holy Cross Monastery interior decorated for the Nativity, January 8, 2012 (Julian Calendar December 26). The monks here live under the omophorion of His Eminence +Hilarion, Metropolitan of the Russian Orthodox Church Outside Russia. The monastery is surrounded by green hedges and is absolutely beautiful, an oasis of tranquility set apart from my bustling town. Visible in the center are the monastery church bells which are rung at various points during the divine services. The monastery grounds are an oasis of stillness in my bustling hometown, set apart from the world. The church’s Russian-style onion dome set it apart from its surroundings. The underlying chasm dividing the Orthodox and Catholic Churches today is that while we come from a shared ancient tradition, major differences in our approaches to ecclesiology, worship, and soteriology developed even before the period of schisms. A millennium out of communion has only further entrenched these differences and added many new ones. Certainly the Roman Church today is far less orthodox than it was in 1054 or 1439. Traditional Catholics will be the first to admit that. Just look at its worship: there is no longer unity in the inner liturgical life of the Church. 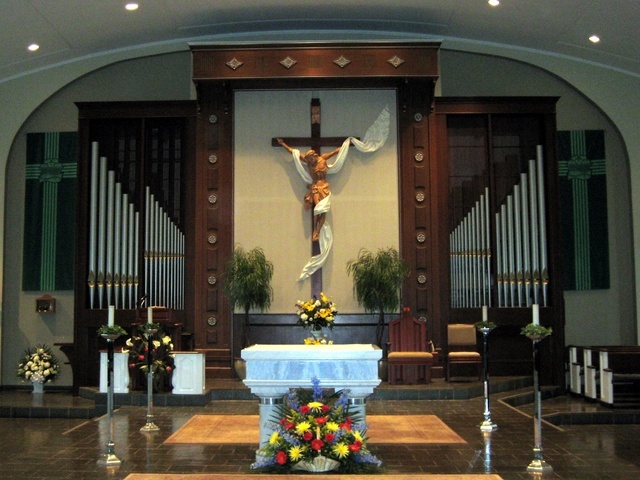 In one parish you have traditionalists clinging to the Latin Tridentine mass, the current Extraordinary Form of the Mass, while in most, you have the much more informal masses in the Novus Ordo style that are a strange juxtaposition of the Roman liturgical rite (spoken, no longer sung,) and vernacular, mostly Protestant or post-Vatican II hymns with diverse instrumental accompaniment, including trumpets and string instruments. 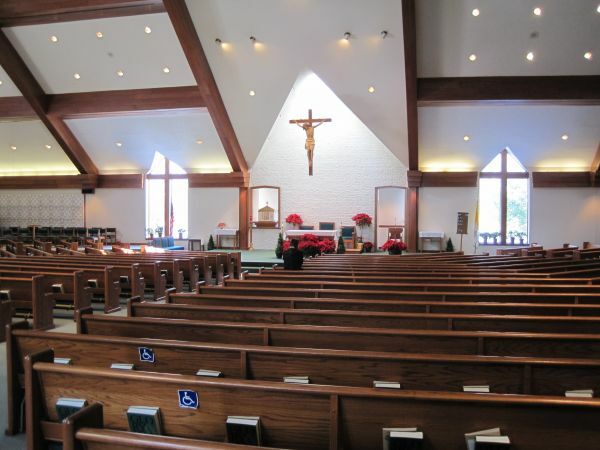 St Elizabeth Ann Seton Catholic Church in Woodbridge, Virginia – this is the parish in which I spent the first seven years of my life, where my grandparents still attend Mass. Its popular ‘folk choir’ always sang to instrumental accompaniment and guitar music. A new pastor’s decision to do away with such an innovation several years ago caused outrage, and Mass attendance remains much lower than it used to be. While Rome (and the Protestant churches which evolved out of and in reaction to the early modern papacy and then split from each other into fragments) defines the Church in an invariably legalistic and rational framework, harking back to Augustinian juridical theory and Scholasticism, Orthodoxy sees the Church as the living and mystically united Body of Christ carried on through the treasured deposit of a living Holy Tradition. 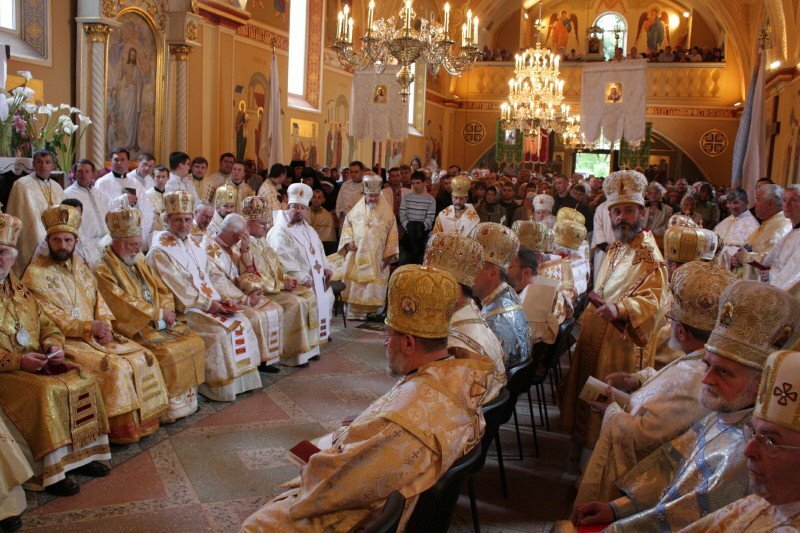 Fidelity to this core has enabled her to defend the faith from within the context of a dynamic fidelity to this Tradition, which means that we value adherence to the faith of the early Church and the maintenance of collegiate conciliarity (Russian: sobornost) as the framework for Church governance. We believe this is the surest ways to carry this living Faith into modernity. While we maintain ‘koinonia’ or communion from within, and see the Church as the faithful everywhere in communion with their bishops, including those living among us and those faithfully departed who sleep in Christ, we are internally accountable for defending and living the Faith – bishops to each other, priests to bishops, laypersons to father confessors and spiritual mothers, and so on. 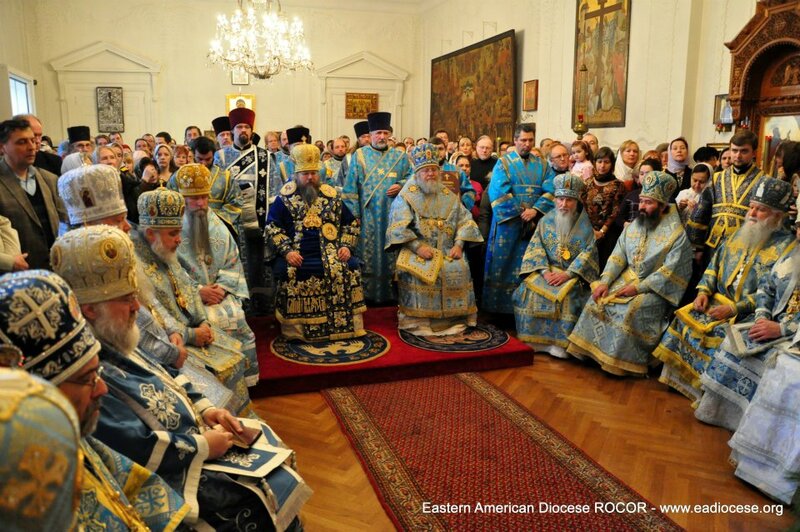 His Beatitude Metropolitan Jonah with His Eminence Metropolitan Hilarion and their respective Synods (OCA and ROCOR). 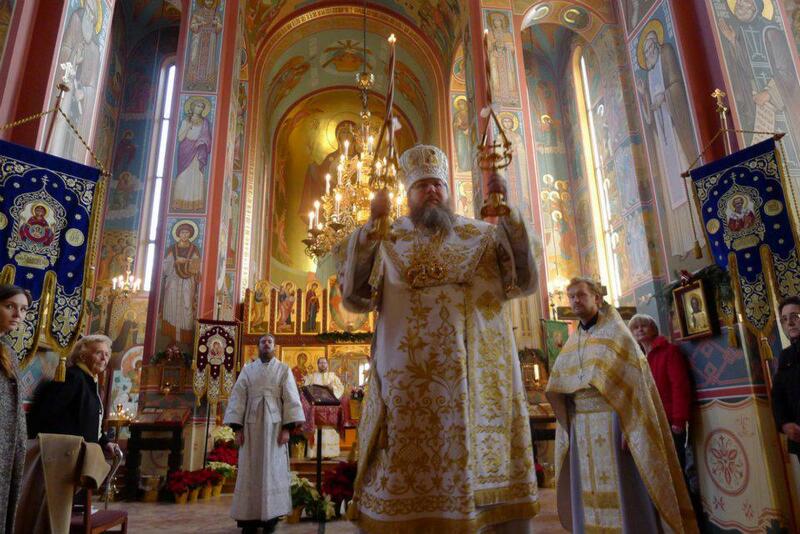 The Orthodox Church in America and ROCOR remain separate jurisdictions or administrations but are fully in agreement on all matters of doctrine and faith, and are in communion with each other. We do not see the need (or the orthodoxy) in vesting one single See, one prelate as ‘Supreme Pontiff’ to maintain the Church from without. Indeed, if one examines the state of the Catholic Church today, one sees liturgical chaos in more liberal parishes and often a reactionary (rather than an organic) conservatism in traditionalist ones which has produced sedevacantists, certain fringe members of the Society of St. Pius X (SSPX), etc. 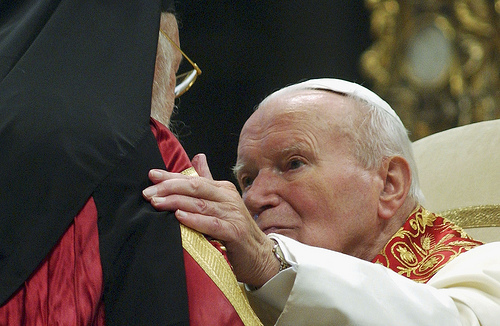 Where is the unity of faith Rome always championed? Sadly, many if not most Catholics are aware that the historic unity of their faith is gone. Rome’s claims to have the intact mantle of the historic Church are deeply and obviously flawed. The Orthodox would point out that while all of the earliest Church Fathers indeed looked to Rome for guidance given the city’s importance as the capital of the Empire and the site of the martyrdoms of many saints including the Apostles Peter and Paul, the primacy of honour and spiritual ‘headship’ over the early Church which Rome came to enjoy was never understood in the way Rome now claims it developed. The Caput Mundi was indeed a great defender of Orthodoxy in the Church’s first centuries, yet its bishops never articulated any conceptions of their own authority over the Catholic (meaning “whole” or one) Church beyond an honorary and historically based primacy as ‘primus inter pares’ among the other Sees. This primacy was principally understood as a mediating and advisory role during the great Ecumenical Councils which all took place in the Christian East, such as when Pope Leo I sent a tome to the Council at Chalcedon in 451. Pope St. Gregory clearly feared that this honorific title and similar ones offered to previous Roman popes could lead to an improper and heterodox elevation of one of the patriarchates above the others. Even the title ‘pope’, meaning ‘father’, was first applied not to the bishop of Rome, but to the Patriarch of Alexandria. Today, the primate of the Coptic Orthodox Church centered in Egypt is still addressed by this ancient title which precedes the Roman one. 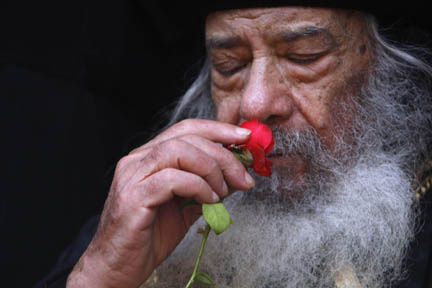 His Holiness Shenouda III was the 117th Pope of Alexandria and head of the Coptic (Egyptian) Non-Chalcedonian (also called Oriental Orthodox) Church, the most ancient Church in north Africa. He fell asleep in the Lord on March 17, 2012. Rather than accept the catholicity of the ancient conciliar form of Church administration and organization, Rome gradually evolved into a hyper-centralized papacy whose bishop came to be seen in the West as a Supreme Pontiff and ‘Vicar of Christ’ with temporal as well as spiritual supremacy over not only the Roman See and the Papal States, but theoretically the whole world. This explains how in 1494 Pope Alexander VI felt empowered in the Treaty of Tordesillas to divide the world on an invisible line between Spain and Portugal to settle the two kingdoms’ disputes over territorial claims in the New World. Such claims served to confirm Orthodox Christians’ apprehensions prior to the Schism that the papacy saw itself as replacing the old Roman Imperium in the West, the same imperium which remained in place in the East for a millennium after ‘Old Rome’ fell to Goths and Vandals. 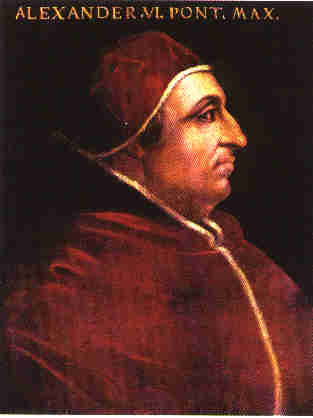 Spanish-born Rodrigo Borja (italianized to “Borgia”) reigned as Pope Alexander VI from 1492 to 1503. A complex character, Alexander patronized some of the leading artists of the period and invited the displaced Spanish Jews whom Queen Isabel and King Fernando had exiled to live in Rome. He also reaffirmed the Roman See’s approval of the Inquisition in Castile and Aragon, and openly made his son Cesare a cardinal. Rumors abounded that he had bought the papacy through bribery. Alexander later employed Cesare as his leading general to fight wars against Milan and France when his rival, Cardinal Giovano della Rovere (later Pope Julius II, r. 1503-13) conspired with these powers to overthrow him. Gradually there arose between East and West profoundly different approaches to spirituality and theology which the language distinctions (Greek East and Latin West) accelerated and then entrenched. The compulsion that medieval Roman Scholastics felt to reconcile the Church’s mysteries and traditions to Aristotelian logic manifested over time in a theological re-orientation that gradually produced a philosophical approach to theological questions which led to a persistent rationalist influence in Catholicism. Fundamental to its claim of papal supremacy and immediate and universal jurisdiction is the Roman Catholic Church’s teaching that St. Peter was the undoubted leader or ‘prince’ of the apostles, even though St. Paul publicly rebuked him in Antioch for his misjudgment of the Judaizing Christians (Galatians 2:11) and James, bishop of Jerusalem, not Peter, presided over the first Church council at Jerusalem described in the Acts of the Apostles. Catholics often point to Matthew 16:18-19 as the justification for Rome’s claims to papal supremacy and universal jurisdiction. But what of John 20:23, where Christ speaks to all the apostles, not only Peter: “Whose soever sins you remit, they are remitted to them; and whose soever sins you retain, they are retained.” ‘You’ here in the Greek appears in the plural usage, confirming that Christ was speaking to the apostles together, giving them all authority to remit sins. Likewise, at Pentecost, the ‘birthday of the Church’, when the Holy Spirit descended to the apostles in “cloven tongues like as of fire” (Acts 2:2) the Spirit hovered over them all, not Peter alone, and they all miraculously spoke in the different languages of the world. Yet in the Catholic tradition, popes are considered Peter’s sole successors and must therefore have immediate and supreme jurisdiction over all Christians. The Second Vatican Council and most recent Catechism of the Catholic Church confirmed the Vatican I-era (1870) dogma of papal infallibility ex cathedra. Similarly, what does the Catholic Church teach happens at the consecration of the Eucharist? The Orthodox view of the Eucharist as a ‘Divine Mystery’ does not hold up to logical Aristotelian formulae, so in the thirteenth century influenced by Thomistic thought the Church dogmatized ‘transubstantiation’. This is the philosophical formula that the elements in the consecration are materially changed and only the ‘accidentals’ of bread and wine, that is, their outward appearance, remain visible. From the Orthodox perspective, we do not see the purpose in attempting to rationalize what the faithful have from time immemorial received reverently as a divine mystery. We do not presume to categorize, prescribe or deny God’s omnipotence and cast unbaptized babies into the abyss, and likewise, we have never dogmatized a view on purgatory, but have always taught that souls require some form of purification if they are to enter into the presence of God in the next world (Revelation 21:27). Rome’s dogmatized teachings in these areas are later developments foreign to the beliefs of the early Christians. Perhaps the chief obstacles to the restoration of communion between the Churches today are the issues of papal infallibility and supremacy. While the Roman Catholic Church teaches that papal infallibility ex cathedra only applies under set conditions, the dogmatic rules for when it should apply are vague. The doctrine was only dogmatically defined at the First Vatican Council in 1870, and the Church’s claims that it was something Catholics had always previously believed is not supported by any evidence. The 1870 Council anathematizes – that is, declares outside of the Church – any person who has “the temerity to question” the dogma of infallibility. If you are a Catholic and do not believe in papal infallibility, your Church teaches dogmatically that you are not actually in it. I cannot believe that a human man could ever be truly incapable of the possibility of error (papal infallibility means that when speaking authoritatively in matters of doctrine to the whole Church, the Pope does not need to consult his brother bishops and cannot err, at all), nor can I reconcile the complete absence of infallibility from the writings of the early Councils and Fathers with Catholic insistence that the early Church believed it. Protestantism which sought to correct Rome’s abuses and distortions (indulgences to get time out of Purgatory, papal supremacy in which the Pope ruled as a temporal monarch over the Papal States and commanded armies, salvation earned largely by works) ended up foundering in the wake of its own contradictions. Within the first generation of the Classical Reformation, disputes arose among Protestant theologians regarding the interpretation of Luther’s ‘solas’, what exactly the role of a Church should be, how to maintain Christian orthodoxy outside of the only Western precedent – papal authority – for doing so, and the nature, number and purpose of the sacraments. Protestants often profess their faith in the Bible as the ‘literal’ Word of God, yet they use hundreds of different editions of the Bible, most without many of the books the Church originally included, and most ignore or are unaware of the scriptural passage which holds that Christ Himself is the Word of God (John 1:1). 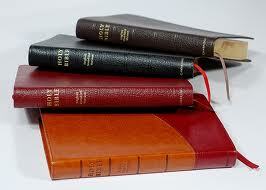 “The Bible contains all things necessary for salvation!” Many Protestants make this or similar statements. Which Bible? There are hundreds of editions. All Protestant bibles have omitted the apocryphal books (the Old Testament books of Tobit, Judith, the Maccabees, Wisdom, Sirach, and Baruch), so almost no Protestants actually use the full and original canon. Basic history tells us that the New Testament did not ‘fall from the sky in one piece’ but was carefully compiled in the first two centuries after Pentecost before it was canonized (put together as one tome or canon, the New Testament). Who put the New Testament together? 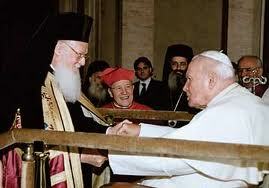 The Orthodox Catholic Church, the One, Holy Catholic and Apostolic Church. Yet if you talk to many Protestants, they talk as though the New Testament dropped out of the heavens completely intact in one instance! Interestingly, this is what Islam traditionally teaches about the Quran. Many Muslims are unaware that the Islamic holy book has gone through several different editions during its translation from the original Arabic, yet devout Muslims believe the Quran to be God’s literal words revealed to their prophet Muhammad. The early Church always taught that the Bible was divinely inspired, but that it must be interpreted within the proper context of Church teachings and careful guidance in the Holy Tradition. For a Christian studying the Scriptures on their own without any guidance from the Church is to risk moving outside the fold of the Church Tradition (into schism). This risks misinterpreting scripture and falling into heresy, as have all Protestant denominations to varying and often incredible degrees. The extent to which many Protestants are completely unaware of the Eastern Church’s existence is matched if not surpassed by their ignorance of much of their own churches’ darker details. This of course is not their fault, given that many older denominations, already losing tens of thousands of members every year, are reluctant to disclose bits of history that portray their founders in unfavorable light. 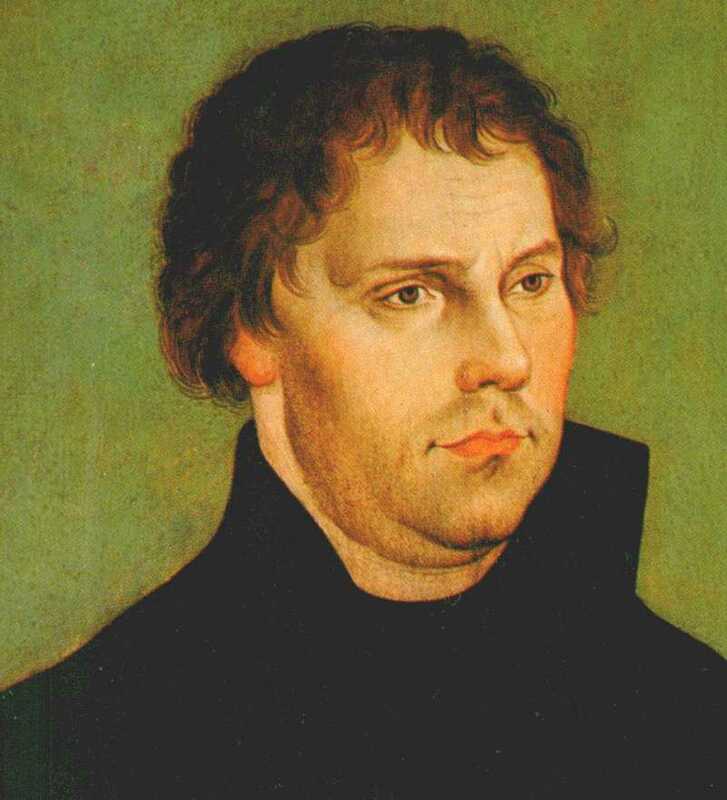 I will cite only one example of the disturbing connection between Martin Luther, ‘father of the Classical Reformation’, and Judaism. Most Lutherans today know nothing about Martin Luther’s violently antisemitic 60,000 word treatise “On the Jews and their Lies”. No Lutheran denomination (there are dozens worldwide spread over different ‘synods’ which differ in many core beliefs) actively teaches its members about their founder’s hate-filled writings. Few Lutherans are ever made aware that Luther’s last treatise used obscenities and vulgar language to refer to Jews, urged Christian princes to expel them from their lands or compel them to do manual labor, and encouraged the destruction of synagogues and the burning of Torah scrolls. Students of history will note that the Nazis paraded in front of an original copy of Luther’s treatise at the 1933 Nuremberg games celebrating their rise to power. In every historically Calvinist country today where the descendants of the so-called predestined ‘elect’ live, rates of church attendance are very low. Wales and Scotland, for example, are countries with some of the lowest rates in Europe, while their demographic percentages of declared atheists are considerably higher than many other places. Did the ‘elect’ simply vanish from these societies – or did the idea of a God who would somehow predestine people before their birth for the fires of hell strike people for what it is: monstrous? Such a capricious God who would create people only to damn them before their birth, who would send His Son into the world for the sole purpose of atoning for the Elect as a Ransom Offering, is the very antithesis of one Who “so loved the world that He gave His only begotten Son, that whosoever believeth in Him should not perish, but have everlasting life.” (John 3:16). Even Luther and Calvin, for all their heresies and inconsistencies, are recognizably Christian in the traditional sense, as anyone who reads their works can see. Yet today the first reformers would not recognize many of the churches named in their honor as Christian communities. Many of the smallest Protestant ‘denominations’ are little more than self-supported ‘solo churches’ of an itinerant preacher, his interpretations of his Bible, and perhaps a radio or television program with a few dozen supporters. Protestantism has produced over 23,000 denominations just on the North American continent alone, and hundreds of these somehow claim to be the “true” Church. 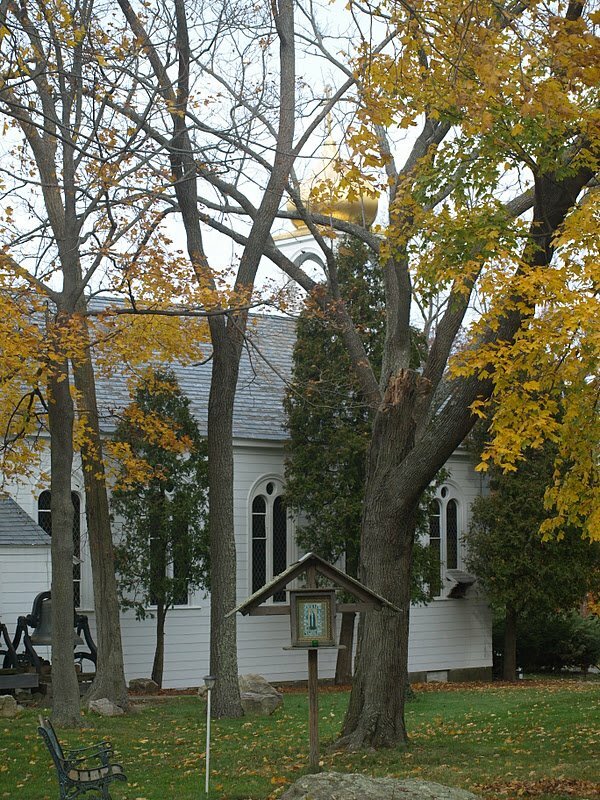 Rather than hold to the historically preserved Truth of the Church, which is impossible by the very nature of Protestantism’s conscious divorce from what had been the historic Church in the West, Protestants seeking to live out their Christian faith cannot appeal to such a Church, since they are outside it. 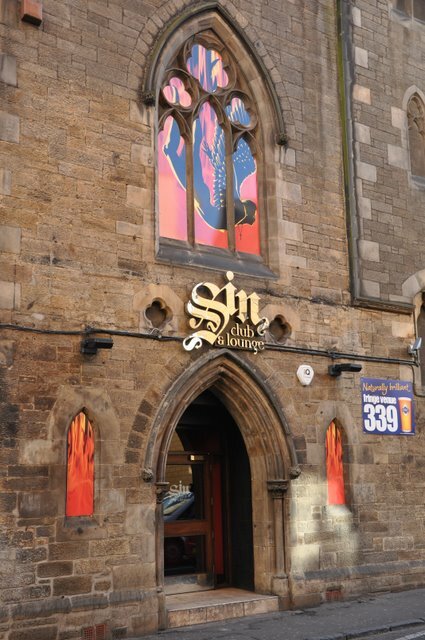 Instead, as part of a broad sectarian movement with thousands of different denominations to “choose from”, they have the recourse to “church shop” until they find a community that suits their particular understanding of the Bible or offers services they enjoy. Where are you to search for Truth, and how can you hold yourself accountable outside the inner Tradition of the historic Church? You cannot. Evangelical ‘Praise and Worship’ services are often analogous to rock concerts in which one’s experience of the ‘rush’ is losing oneself in the drama of Christian rock or specifically designated ‘P&W’ music, flashing lights and visual-audio effects. As to how that fosters anything other than self-focused spiritual ‘ecstatic’ experiences or ‘high’s, I have no idea. Most evangelical Christians are entirely unfamiliar with Orthodoxy, and those who do enter an Orthodox church are often stupefied, since what they come into contact with is essentially the polar opposite of their normative church experience. Their only point of reference with ‘elaborate’ traditional liturgical worship is usually an often deeply misguided idea about what the Roman Catholic Church was and what it now is. Most are unaware that the Catholic Church in the English-speaking world has recently seen a lot of liturgical modifications and attempts by some parishes at innovations in musical and instrumental style that would actually be very acceptable for the evangelical ‘P&W’ approach to “doing church”. Unsurprisingly, it is not uncommon for many evangelicals to assume that Orthodoxy is some ‘weird ethnic offshoot’ of Catholicism when they first encounter it. Yet interestingly, in the Orthodox Church in America, many of our converts are from evangelical backgrounds. When we Orthodox look at contemporary Western society and see evangelical non-denominational Christians as the most vocal defenders of traditional values, people who are often proponents of the ‘born again’ experience of ‘one and done’ single moment salvation, we cannot help but wonder. How can such a minimalist, instant gratification view of one’s salvation possibly inspire anyone to work to heal and transform their lives if they believe they are already and irrevocably saved? Much less, how can such a view inspire these people to heal the pain and the confusion that moral relativism and post-modernist apathy have wrought in our society, if these people cannot (or do not think they need to) work to transform themselves? Without the humility and patience which Orthodoxy leads her faithful to cultivate in cooperation with the Holy Spirit, I do not see how Western society can heal itself and fight the cancers of abject relativism and hedonism into which so many in our society have fallen. Roman Catholicism has gradually distorted and expanded the original role of the Papacy to the extent that for those who firmly adhere to traditional Catholic teachings, the Pope indeed often becomes an idol, while many liberal Catholics often live and think consciously or unknowingly as Protestants within their Church, for various reasons choosing not to break away. I hear from so many people who are raised Catholic that they believe “communion is communion”, whatever it means to them. They do not understand transubstantiation, and most have not even heard of papal infallibility. What does this mean for the Roman Catholic Church when potentially millions of its members are so essentially ignorant about core doctrines of their faith? If Catholics are left to be Catholic “on their own terms”, without the authoritative instruction in the faith provided by pastoral bishops, how does this distinguish them from Protestants? Over what unity in faith will Rome preside? The first Protestants’ intentions in purifying the Catholic Church of its errors were undoubtedly well-intended, but to argue that the Bible alone contains all things necessary for salvation, when the very New Testament was put together by the apostolic Church, ignores the crucial – and Orthodox would say paramount – role which Holy Tradition and the apostolic Church play in guiding the lives of the faithful. This has consequentially led to the birth of thousands of heretical and schismatic groups, many of which are today barely recognisable as Christian, because Protestants ultimately have no source of authority beyond their own subjective interpretation of the Bible or their pastor’s. While Rome maintained “unity without freedom”, and has since the Second Vatican Council increasingly lost that inner unity of faith and common adherence to tradition, Protestantism has come to embody “freedom without unity”. Neither branch or part of Western Christianity has preserved the original faith of the early Church. So what are Christians looking for the fullness of the Christian faith to do? Look to the East, for we have never lost or corrupted it! Every one of our bishops can trace his lineage of apostolic succession back to one of the original Twelve. 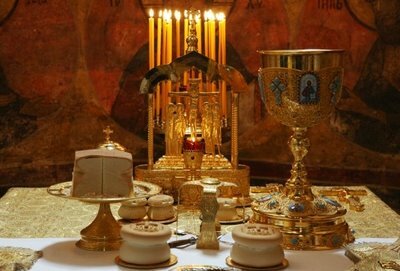 In our worship we approach the divine in a spirit of reverence, humility, mystery, and joy unique to our Church, and we preserve our ancient liturgies as they have been handed down to us for centuries, a key in the “faith once delivered to the saints” (Jude 1:3). The liturgy informs and has impacted all aspects of Orthodox spiritual life, especially the prayers we use in our daily devotions outside of church. Spiritual life in the Eastern tradition focuses primarily on a relationship-centered approach to salvation, that is, seeing God as the ‘physician of our souls’ and salvation as a process of theosis (divinization) through prayer of the heart, love for God and the other, perpetual repentance and opening ourselves up to the transformative grace of the Holy Spirit, rather than in the more contractual or legalistic Western understanding whereby sinners are damned to hell or cut off from God and the righteous saved. We believe we are saved together, just as together we work to defend and maintain the inner Tradition of the Church under the guidance, direction, and counsel of our ruling bishops. In our preparation prayers before we receive communion, we ask that our participation in the Eucharist be neither to our “judgment nor condemnation, O Lord, but to the healing of soul and body.” These last words speak volumes as to why we pray, why we commune, and why we seek to find salvation through the path provided by this ancient Church. The Orthodox do not teach nor have we ever taught that salvation is only possible within our Church, for such a claim denies the limitless grace and omnipotence of God. He works in mysterious ways, hastening to all people who seek Him, including the repentant thief on the Cross. For anyone seeking the authentic, original faith of the Church Fathers, the original and historic Body of Christ, it can only be found here. 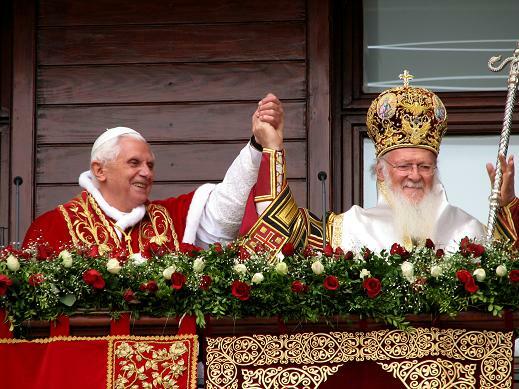 In every faith there is the Seed of the Word of God (Luke 8:11), a hint of Christ in all traditions and all peoples, for we are all made in the image of God, but only in the Orthodox Church will you find the fullness of the ancient Christian faith preserved, defended and fully alive today. St Nicholas Cathedral in Washington, D.C. is a capital landmark heritage site, my parish and the primatial cathedral of His Beatitude Metropolitan Jonah. “Do you see God’s love for us? And who shall describe His mercy? O my brethren, on my knees I beg you to believe in God—believe that there is a Holy Spirit Who bears witness to Him in every church, and in my soul. The Holy Spirit is love; and the souls of all the holy who dwell in heaven overflow with this love. And on earth this same Holy Spirit is in the souls of those who love God. All heaven beholds the earth in the Holy Spirit, and hears our prayers and carries them to God.”-St Silouan the Athonite. 1866-1938.